^ Harding E. Smith. The Hertzsprung-Russell Diagram. Gene Smith's Astronomy Tutorial. Center for Astrophysics & Space Sciences, University of California, San Diego. 1999-04-21 [2009-10-29]. ^ Richard Powell. The Hertzsprung Russell Diagram. An Atlas of the Universe. 2006 [2009-10-29]. ^ 3.0 3.1 Adams, Fred C.; Laughlin, Gregory. A Dying Universe: The Long Term Fate and Evolution of Astrophysical Objects. Reviews of Modern Physics. April 1997, 69 (2): 337–372. Bibcode:1997RvMP...69..337A. doi:10.1103/RevModPhys.69.337. ^ 4.0 4.1 Gilmore, Gerry. The Short Spectacular Life of a Superstar. Science. 2004, 304 (5697): 1915–1916 [2007-05-01]. PMID 15218132. doi:10.1126/science.1100370. ^ Longair, Malcolm S. The Cosmic Century: A History of Astrophysics and Cosmology. Cambridge University Press. 2006: 25–26. ISBN 0-521-47436-1. ^ 6.0 6.1 Brown, Laurie M.; Pais, Abraham; Pippard, A. B. (编). Twentieth Century Physics. Bristol; New York: Institute of Physics, American Institute of Physics. 1995: 1696. ISBN 0-7503-0310-7. OCLC 33102501. ^ 7.0 7.1 Russell, H. N. "Giant" and "dwarf" stars. The Observatory. 1913, 36: 324–329. Bibcode:1913Obs....36..324R. ^ Strömgren, Bengt. On the Interpretation of the Hertzsprung-Russell-Diagram. Zeitschrift für Astrophysik. 1933, 7: 222–248. Bibcode:1933ZA......7..222S. ^ 11.0 11.1 11.2 Unsöld, Albrecht. The New Cosmos. Springer-Verlag New York Inc. 1969: 268. ISBN 0-387-90886-2. ^ 13.0 13.1 13.2 Kroupa, Pavel. The Initial Mass Function of Stars: Evidence for Uniformity in Variable Systems. Science. 2002, 295 (5552): 82–91 [2007-12-03]. PMID 11778039. doi:10.1126/science.1067524. ^ Schilling, Govert. New Model Shows Sun Was a Hot Young Star. Science. 2001, 293 (5538): 2188–2189 [2007-02-04]. PMID 11567116. doi:10.1126/science.293.5538.2188. ^ Zero Age Main Sequence. The SAO Encyclopedia of Astronomy. Swinburne University. [2007-12-09]. ^ 16.0 16.1 16.2 16.3 Clayton, Donald D. Principles of Stellar Evolution and Nucleosynthesis. University of Chicago Press. 1983. ISBN 0-226-10953-4. ^ Main Sequence Stars. Australia Telescope Outreach and Education. [2007-12-04]. ^ Moore, Patrick. The Amateur Astronomer. Springer. 2006. ISBN 1-85233-878-4. ^ White Dwarf. COSMOS—The SAO Encyclopedia of Astronomy. Swinburne University. [2007-12-04]. ^ Origin of the Hertzsprung-Russell Diagram. University of Nebraska. [2007-12-06]. ^ A course on stars' physical properties, formation and evolution (PDF). University of St. Andrews. [2010-05-18]. ^ Siess, Lionel. Computation of Isochrones. Institut d'Astronomie et d'Astrophysique, Université libre de Bruxelles. 2000 [2007-12-06]. [永久失效連結]—Compare, for example, the model isochrones generated for a ZAMS of 1.1 solar masses. This is listed in the table as 1.26 times the solar luminosity. At metallicity Z=0.01 the luminosity is 1.34 times solar luminosity. At metallicity Z=0.04 the luminosity is 0.89 times the solar luminosity. ^ Zombeck, Martin V. Handbook of Space Astronomy and Astrophysics 2nd. Cambridge University Press. 1990 [2007-12-06]. ISBN 0-521-34787-4. ^ SIMBAD Astronomical Database. Centre de Données astronomiques de Strasbourg. [2008-11-21]. ^ Luck, R. Earle; Heiter, Ulrike. Stars within 15 Parsecs: Abundances for a Northern Sample. The Astronomical Journal. 2005, 129 (2): 1063–1083. Bibcode:2005AJ....129.1063L. doi:10.1086/427250. ^ LTT 2151 -- High proper-motion Star. Centre de Données astronomiques de Strasbourg. [2008-08-12]. ^ Staff. List of the Nearest Hundred Nearest Star Systems. Research Consortium on Nearby Stars. 2008-01-01 [2008-08-12]. （原始内容存档于2012-05-13）. ^ 28.0 28.1 28.2 28.3 Brainerd, Jerome James. Main-Sequence Stars. The Astrophysics Spectator. 2005-02-16 [2007-12-04]. ^ 29.0 29.1 29.2 Karttunen, Hannu. Fundamental Astronomy. Springer. 2003. ISBN 3-540-00179-4. ^ Bahcall, John N.; Pinsonneault, M. H.; Basu, Sarbani. Solar Models: Current Epoch and Time Dependences, Neutrinos, and Helioseismological Properties. The Astrophysical Journal. 2001-07-10, 555 (2): 990–1012. Bibcode:2003PhRvL..90m1301B. doi:10.1086/321493. ^ Ziebarth, Kenneth. On the Upper Mass Limit for Main-Sequence Stars. Astrophysical Journal. 1970, 162: 947–962. Bibcode:1970ApJ...162..947Z. doi:10.1086/150726. ^ Burrows, A.; Hubbard, W. B.; Saumon, D.; Lunine, J. I. An expanded set of brown dwarf and very low mass star models. Astrophysical Journal, Part 1. March 1993, 406 (1): 158–171. Bibcode:1993ApJ...406..158B. doi:10.1086/172427. ^ Aller, Lawrence H. Atoms, Stars, and Nebulae. Cambridge University Press. 1991. ISBN 0-521-31040-7. ^ Bressan, A. G.; Chiosi, C.; Bertelli, G. Mass loss and overshooting in massive stars. Astronomy and Astrophysics. 1981, 102 (1): 25–30. Bibcode:1981A&A...102...25B. ^ Gough, D. O. 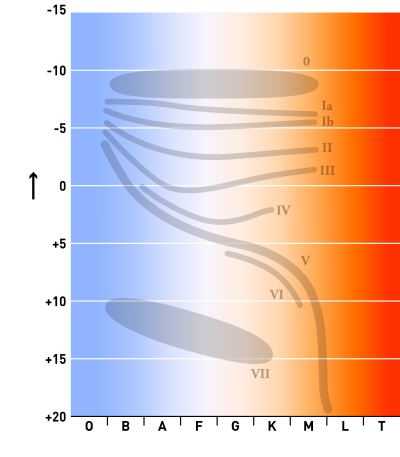 Solar interior structure and luminosity variations. Solar Physics. 1981, 74 (1): 21–34. Bibcode:1981SoPh...74...21G. doi:10.1007/BF00151270. ^ Padmanabhan, Thanu. Theoretical Astrophysics. Cambridge University Press. 2001. ISBN 0-521-56241-4. ^ Wright, J. T. Do We Know of Any Maunder Minimum Stars?. The Astronomical Journal. 2004, 128 (3): 1273–1278 [2007-12-06]. doi:10.1086/423221. ^ Tayler, Roger John. The Stars: Their Structure and Evolution. Cambridge University Press. 1994. ISBN 0-521-45885-4. ^ Richmond, Michael W. Stellar evolution on the main sequence. Rochester Institute of Technology. 2004-11-10 [2007-12-03]. ^ 46.0 46.1 Prialnik, Dina. An Introduction to the Theory of Stellar Structure and Evolution. Cambridge University Press. 2000. ISBN 0-521-65937-X. ^ Schröder, K.-P.; Connon Smith, Robert. Distant future of the Sun and Earth revisited. Monthly Notices of the Royal Astronomical Society. May 2008, 386 (1): 155–163. Bibcode:2008MNRAS.386..155S. doi:10.1111/j.1365-2966.2008.13022.x. ^ Arnett, David. Supernovae and Nucleosynthesis: An Investigation of the History of Matter, from the Big Bang to the Present. Princeton University Press. 1996. ISBN 0-691-01147-8. —Hydrogen fusion produces 8×1018 erg/g while helium fusion produces 8×1017 erg/g. ^ For a detailed historical reconstruction of the theoretical derivation of this relationship by Eddington in 1924, see: Lecchini, Stefano. How Dwarfs Became Giants. The Discovery of the Mass-Luminosity Relation. Bern Studies in the History and Philosophy of Science. 2007. ISBN 3-9522882-6-8. ^ Imamura, James N. Mass-Luminosity Relationship. University of Oregon. 1995-02-07 [2007-01-08]. （原始内容存档于2006年12月14日）. ^ Sitko, Michael L. Stellar Structure and Evolution. University of Cincinnati. 2000-03-24 [2007-12-05]. （原始内容存档于2009-08-23）. ^ Staff. Post-Main Sequence Stars. Australia Telescope Outreach and Education. 2006-10-12 [2008-01-08]. ^ Girardi, L.; Bressan, A.; Bertelli, G.; Chiosi, C. Evolutionary tracks and isochrones for low- and intermediate-mass stars: From 0.15 to 7 Msun, and from Z=0.0004 to 0.03. Astronomy and Astrophysics Supplement. 2000, 141 (3): 371–383. doi:10.1051/aas:2000126. ^ Poelarends, A. J. T.; Herwig, F.; Langer, N.; Heger, A. The Supernova Channel of Super-AGB Stars. The Astrophysical Journal. March 2008, 675 (1): 614–625. doi:10.1086/520872. A java based applet for stellar evolution. Charity, Mitchell. What color are the stars?. Vendian Systems. 2001-06-04 [2008-11-26].